Il suo aspetto estetico e il peso leggero ne fanno l'ampli dei sogni per chi suona live. ma anche di perdere il lavoro di anni, se usato in maniera incosciente. Amplificatore per chitarra o Rhodes valvolare Fender 65 Twin Reverb Amp, in condizioni pari al nuovo! Fender Mini '57 Twin-Amp Tweed Mini Amplificatore Combo 1W 2x2 Portatile a batterie. Mini '57 Twin Amp. 081.526.2249 339.6078952. AMP GITARREN-VERSTÄRKER. GUTER ZUSTAND. einfach anrufen! Denn für jedes Problem gibt es eine Lösung! Besonders spezialisiert sind wir im Bereich Markenschmuck. Wir kaufen Einzelstücke, sowie Ihre gesamte Sammlung. Fender Twin-Amp Guitar Combo, Verstärker für E-Gitarre inkl. 4-Button Footswitch. - Speakers 2-12" Special Design Eminence® 8 ohm, 50 watt Speakers, p/n 0994812002. - Type Tube Guitar Amplifier. Vollröhren Combo. Röhren Endstufe: 4x 6L6. Was dieser Amp schon alles erlebt hat! Wohl keine Location, die er noch nicht gesehen hat. Rock, Jazz, Country usw. - so muss eine E-Gitarre klingen! 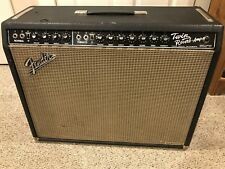 Fender '65 Twin Reverb. Ya sea rock, blues, country, jazz o cualquier otro estilo, el Twin Reverb ha definido el sonido limpio de la guitarra eléctrica. Con sus dos altavoces de 12, la estética atemporal y su sonido esencial, el ’65 Twin Reverb® es un magnífico amplificador que te transporta a una era electrizante con un sonido y estilo Fender definitorios. Mini jack headphone jack. 081.526.2249 339.6078952. Fender Mini Twin Amp-Tweed-con batteria-tecnica. pieno I.O. Voll funktionsfähig. Die Ware wird unter Ausschluss jeglicher Gewährleistung verkauft. Wie auf Bildern zu sehen. Optischer Zustand. Branchez-vous et utilisez le son Fender à une fraction de la taille, quelle que soit votre style. Sortie casque sur mini Jack 3,5 mm. Clip ceinture. Combo inclinable. Manico in pelle Mini formato riproduce anche la parte della maniglia. Type Guitar amp. Battery 1 9 V battery. Impedance (ohms) 4ohms. UPC 0684191201097. MPN TWIN-AMP. Battery type Lithium. non esitate a contattarci. One-watt single-channel amplifier. - Two 3" speakers. - Tilt-back kickstand and belt clip on back. Dieser kleine 57er Twin Amp läßt die 50er Jahre zu neuem Leben erwecken. Der Verstärker ist mit Tweed bezogen und gibt auch Fender-Fans, die sich keinen echten Tweed-Amp leisten können, die Möglichkeit, sich ein Stück Fender-Geschichte nach Hause zu holen. Entrada de jack de auricular de 1/8. 2 altavoces de 3. Die Marching-Abteilung bei music world hat es ebenfalls in sich. 2x 2' Lautsprecher. Spannungsversorgung über 9 Volt Batterie oder externes Netzteil (beides optional erhältlich). Le Fender Mini '57 Twin-Amp apporte une touche Fender années cinquante dans un format ultra compact. Il au moyen d'une pile 9 volts ou d'un adaptateur, disponible en option. Sa finition en tweed et sa poignée en cuir. MPN: 0234811000. MPN 0234811000. Catturare la. Migliore di tutti, questo uno-watt amplificatore. Amplificatore monocanale ・1W. Tipo: MINI 57 TWIN. Progettato per replicare lo stile tradizionale e costruttivi fo il leggendario 57 Twin-Amp, questo. Der Umschlag weist einige Altersspuren auf. Uno-watt amplificatore monocanale. MPN Mini '57 Twin-Amp. Model Mini '57 Twin-Amp. (Si prega di leggere). Enchufa los auriculares de 1/4” y consigue un sonido increíble para practicar o incluso utilízalo como salida de línea hacia un amplificador o equipo de grabación. 1 Watt - 2x 2" Lautsprecher - 9 Volt AC Anschluss - Kopfhöreranschluss. - 2x 2" Lautsprecher. Auch und gerade die Einschaltung eines Rechtsanwalts bezüglich einer für uns kostenpflichtige Abmahnung und (strafbewehrte) Unterlassungserklärung ist als Verstoß gegen § 8 IV UWG anzusehen, da dies insbesondere vorwiegend dazu dient, gegen den „Zuwiderhandelnden“ einen Anspruch auf Ersatz von Aufwendungen oder Kosten der Rechtsverfolgung entstehen zu lassen. Clean for its age, show signs of wear on Tolex and cloth. Up for sale aFender Twin-Amp Pro Tube 100/25-Watt 2x12" Guitar Combo Amplifier w/Footswitch - #LO-626233! Also, there are velcro tapes, scratches, nicks and other signs of wear on the footswitch (see 11th picture). 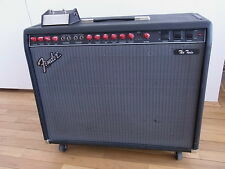 This is a 1965 Fender Twin Reverb. Reverb 606-445. Reverb and tremolo work as you would expect, and original footswitch is included. Power tubes are all RCA Blackplates, rectifier is a Mullard, Pre's are all original RCA and GE. 1965 Fender Twin Reverb Fender footswitch Fender amp crover new 220 to 110v converter. Model:Twin reverb amp AB763/110V. Fender '57 Custom Twin Amp. 40 watts of power from a pair of 6L6 power tubes and two custom designed 12″ Eminence Speakers. Excellent, near new condition with no wear and the original top card still intact. The Fender Cyber Twin 2x12 Amp is Fender's best guitar amp. Includes two footswitches, wheels, and a cover. This amp is in great condition and does not seem to have been played through much. ESTIMATES ONLY ! 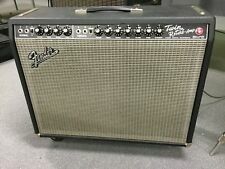 This is a FENDER Mini Twin MT-10 portable guitar amp is full working order. Fender Cyber Twin interpolated tone for amp design. I can answer ASAP! ARIGATO GOZAIMASU! Japanese products, I can help you! From Hiroshima, Far east island Japan! I can answer ASAP! From Hiroshima, Far east island Japan! EMS 2-3weeks arrive! If you need ASAP! Plug into this little gem and you're back in the 60's. This mini version of a 1965 Fender Twin amp is a powerful 1 watt mini amp with two special design 3" speakers for authentic Fender style and sound. Fender Twin Reverb and Showman tube set by Tube Amp doctor. Two 3" special design speakers. Authentic Fender style and sound. REAL SUPPORT. Authorized Dealer. May i add it sounds great! 1-watt Twin. Fender Mini-Twin practice amplifier. Limited Edition MT-10 silverface. FENDER TWIN REVERB AMPLIFIER AMP COFFEE MUG CUP NEW IN GIFT BOX. Stick on your favourite record and turn the music up loud before enjoying a cuppa in this super-fun Fender Amp Mug. This oversized ceramic mug is in the shape and design of a classic Fender amp, allowing you to enjoy your next tea break in style. Guitar Amplifiers. Guitar Accessories. Guitar Cables. Guitar Care. Guitar Picks. Guitar and Bass FX. One-watt single-channel amplifier. Keyboards / Piano. JJ/Tesla Brand includes: (3) T-12AT7-JJ (1) T-6L6GC-JJ-MQ (Apex Matched), which includes: (4) T-6L6GC-JJ (5) T-12AX7-S-JJ . Normal wear associated with a 50 year old original cover. COVER ONLY. Great original Cover. length (width)-26". These tubes are APEX MATCHED. These systems are a result of many, many years of experience and an incredible amount of planning, design, prototyping, and testing resulting in the best tube matching available in the entire industry. NEW - GENUINE FENDER OPTOISOLATOR ASSEMBLY. Designed for use with the Fender '65 Twin amplifier. Other alphabets (Cyrillic, Japanese, Chinese, etc.) will not be translated and your item will be delayed. 10% Off-FENDER MINI TWIN MT-10 PORTABLE GUITAR AMP - Mint Cond. Runs on 9v battery (not included), or on 9v AC/DC adaptor (Also not included). Portable Mini Amp in Excellent Working Condition. Great Sound! Perfect for practice, small space performance.